The Samsung Galaxy S4 was formally unveiled last week and is a truly notable new handset headed for a worldwide release starting in April. Now that it is official at last we thought it would be interesting to look at a comparison of the Galaxy S4 vs. the older iPhone 5, showing what they each have to offer. This is a video comparison as sometimes it’s easier to digest the information when you can see the devices. If you are trying to decide between these two handsets then you may choose one over the other simply because of your preference of the Android operating system or Apple’s iOS but if you have an open mind we’ll just briefly recap the key specs of each. Obviously we cannot give every single specification and feature of these two phones as there are simply too many mention but the video will give you more information. For the Galaxy S4 you’re looking at either a 1.6GHz Exynos Octa-core processor or 1.9GHz Qualcomm quad-core processor (dependent on market), a 5-inch Super AMOLED display with resolution of 1920 x 1080 with 441 ppi, 2GB of RAM and 16,32 or 64GB of internal storage, expandable via microSD. There’s also a 13-megapixel rear camera, 2-megapixel front-facing camera, 2,600 mAh battery, Wi-Fi 802.11 a/ac/b/g/n, Bluetooth 4.0 and it all runs on Android 4.2.2 Jelly Bean with Samsung’s TouchWiz UI. It comes in black or white color options. 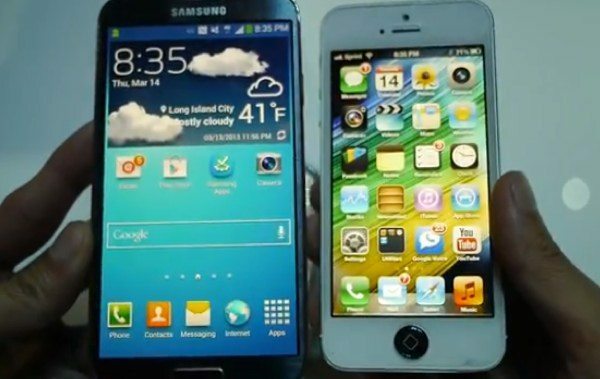 The iPhone 5 by comparison was released last September so specs aren’t as up-to-date as for the Galaxy S4. It has a 1.2GHz Apple A6 dual-core processor, 4-inch LED-backlit IPS LCD display with resolution of 1136 x 640 and 326 ppi, 1GB of RAM and 16, 32 or 64G of internal storage (non-expandable). There’s also an 8-megapixel rear camera and 1.2-megapixel front-facing camera, 1,440 mAh battery, Wi-Fi 802.11 a/b/g/n, Bluetooth 4.0 and it runs on iOS 6, upgradable to iOS 6.1.2. The iPhone 5 comes in either black and slate or white and silver options. The almost 4-minute video comparison on YouTube looks at the design and build quality, display, software and more and the iPhone 5 is found to be more satisfying construction wise with a more solid feel and premium materials while the Galaxy S4 once again has a cheap plastic look and feel as we discussed yesterday. For features though the Samsung Galaxy S4 wins hands-down with some really innovative new software and it’s noted that there are many more shooting modes for the camera too, which improves on that of the iPhone 5. This video gives a really good look at some of the differences between these two handsets and hopefully after viewing it you’ll be closer to making up your mind between these two smartphones. You can watch the video that we’ve embedded for you below this story and we’d be grateful if you would come back here afterwards and let us have your comments. If you had to choose between either off these handsets right now, would you opt for the Galaxy S4 or the iPhone 5?